Taking the high ground can mean morally, as cultures without survival at stake can use the phrase; or as a defense, where those who are subject to invasions can necessarily use the term: the physical advantage of being literally above the enemy, for purposes of projectiles, and fatiguing the enemy. Spis Castle is the physical high ground, a prominent marker and bulwark against Ottoman and other invaders, a crossroads of trade routes so the visibility mattered to the lost or threatened. It occupies a huge footprint. Spis Castle, Slovakia, occupies a site with habitation for over millennia. This site claims people living here 40,000 years ago. 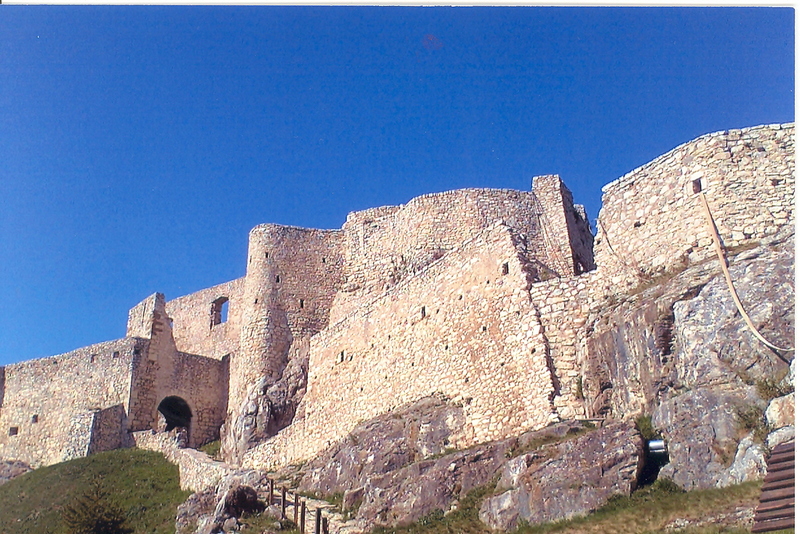 As a medieval fortress, it was rock built on rock by 1249, see http://www.spisskyhrad.sk/en.html. Opening and closing times may not correlate with the guide book. Arrive nowhere at 4PM, expecting an hour to go. We literally had to run inside at 4, expecting a 5PM closing, and run around to get our views of this wonderful place. There was construction-renovation going on, and the construction-renovation schedule for workers superseded anything tourist.